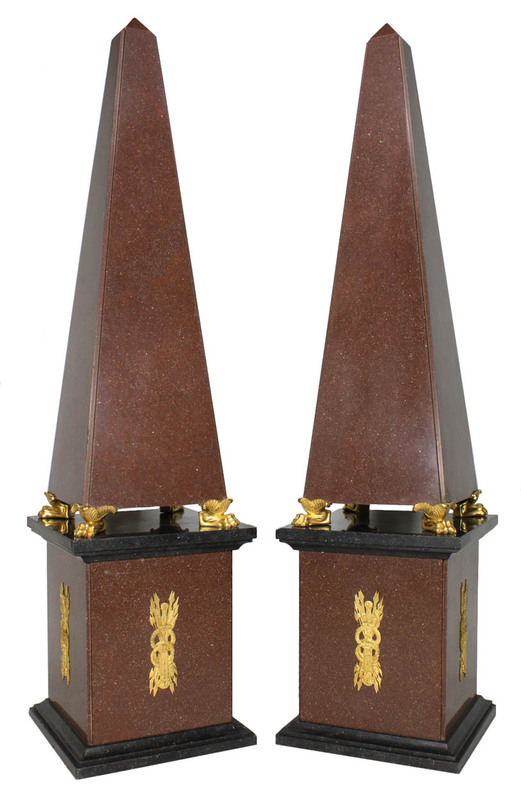 A Monumental and Fine Pair of French 19th/20th Century Empire Style Red Porphyry and Gilt-Bronze Mounted Obelisks on Four Gilt-Bronze Lion Paws both resting on conforming porphyry and black slate plinths surmounted with allegorical Empire gilt-bronze mounts. Circa: 1900. 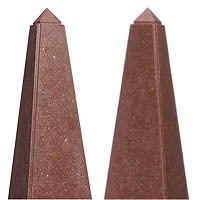 An obelisk is a tall, four-sided, narrow tapering monument which ends in a pyramid-like shape at the top. 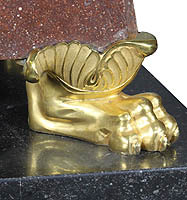 These were originally called "tekhenu" by the builders, the Ancient Egyptians. The Greeks who saw them used the Greek 'obeliskos' to describe them, and this word passed into Latin and then English. Ancient obelisks were often monolithic, whereas most modern obelisks are made of several stones and can have interior spaces. Obelisks have been erected througout time as an Imperial and Solar symbol which also had the practical function for determining landmarks or special locations. 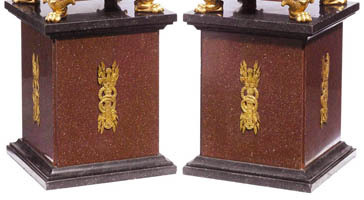 Porphyry has been prized since antiquity for its lustrous colour (the word derives from the Greek for purple) and remarkable hardness. The Romans imported porphyry in great quantities from ancient Egypt, using it both in architectural schemes and to carve portrait busts. Its rich purple colour, the Imperial symbol of power, was no doubt of special significance in ancient Rome and with the rediscovery of classical Rome in the Renaissance period, the potent symbolism of porphyry was prized once again, and it was avidly collected by powerful figures such as the Medicis, Louis XIV (who had a buying agent in Rome for his acquisitions), as well as the cardinals de Richelieu and Mazarin. The term "porphyry" is from Greek and means "purple". Purple was the color of royalty, and the "Imperial Porphyry" was a deep purple igneous rock with large crystals of plagioclase. The rock was the hardest known in antiquity and was prized for monuments and building projects in Imperial Rome and later.